We previously reported that Jersey Shore Family Vacation star Jenni JWoww Farley and her husband Roger Mathews have been Split. 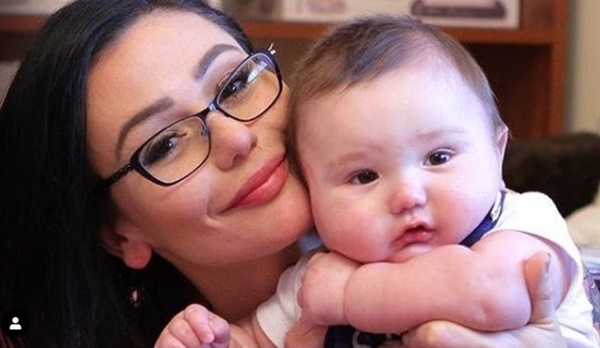 CelebNReality247.com reports that JWoww is accusing her estranged husband, Roger, of violent outbursts, putting their kids in danger, conspiring with her exes. The Jersey Shore Family Vacation star is sharing a disturbing video, apparently of him throwing her to the ground. 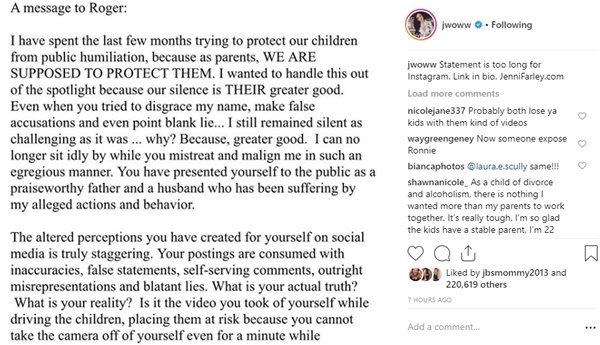 JWoww starts off saying in “A Message to Roger” alleging Roger Mathews was abusive to her on multiple occasions over the course of their 3-year marriage. Farley posted a lengthy statement on her website Wednesday. I HAVE SPENT THE LAST FEW MONTHS TRYING TO PROTECT OUR CHILDREN FROM PUBLIC HUMILIATION BECAUSE AS PARENTS, WE ARE SUPPOSED TO PROTECT THEM. 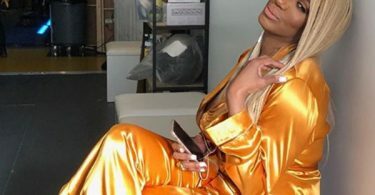 She goes on to say that she wanted to keep their problems out fo the public eye, but after he tried to “disgrace” her name, and “make false accusations” she had to go public and show the domestic abuse he has put her through. I WANTED TO HANDLE THIS OUT OF THE SPOTLIGHT BECAUSE OUR SILENCE IS THEIR GREATER GOOD. EVEN WHEN YOU TRIED TO DISGRACE MY NAME, MAKE FALSE ACCUSATIONS AND EVEN POINT BLANK LIE… I STILL REMAINED SILENT AS CHALLENGING AS IT WAS … WHY? BECAUSE GREATER GOOD. I CAN NO LONGER SIT IDLY BY WHILE YOU MISTREAT AND MALIGN ME IN SUCH AN EGREGIOUS MANNER. YOU HAVE PRESENTED YOURSELF TO THE PUBLIC AS A PRAISEWORTHY FATHER AND A HUSBAND WHO HAS BEEN SUFFERING BY MY ALLEGED ACTIONS AND BEHAVIOR. Further, in the detailed open letter, she states that Roger hurt her and the children. YOU HURT THE CHILDREN AND YOU HURT ME. WHEN WILL IT END? THE CHILDREN ARE THE ONLY PRIORITY. YOUR ACTIONS HAVE AND CONTINUE TO PLACE THE CHILDREN IN HARM’S WAY. STOP, PAUSE AND HAVE A TRUE REALITY CHECK. JWoww also points out how Roger contacted her ex-boyfriend and got him arrested. IT IS INCONCEIVABLE THAT YOU PERSONALLY RESEARCHED THE WHEREABOUTS AND CONTACTED EX BOYFRIENDS OF MINE TO INFLICT HARM UPON ME AFTER I FILED FOR DIVORCE AND YOU WERE REMOVED FROM THE HOME AS A RESULT OF A TEMPORARY RESTRAINING ORDER. IT IS UNFATHOMABLE TO ME THAT BECAUSE OF YOU PROACTIVELY CONTACTING AN EX-BOYFRIEND OF MINE TO TEAM UP AGAINST ME, HE WAS ARRESTED FOR TRYING TO EXTORT MONEY FROM ME.